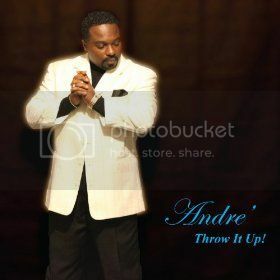 The singer of gospel music known as Andre' Williams has released his new EP record, titled, “Throw it Up!” The extended play record is comprised of three original tracks and a remix of the EP's title single for an approximate total listening time of 17 minutes. The album has been published on the SOS Productions music label based in Fort Worth, TX. An inspirational, worshipful and entirely heartfelt collection of contemporary Christian music, “Throw it Up!” by Andre' Williams is an early breakout must-have for listeners of the genre, and for believers in Christ around the world. All of Williams' music is written, arranged, performed and produced by the singer, himself. His music combines attributes of modern gospel, soul, R 'n' B and contemporary fusion jazz. Andre' Williams has also said that his passion is ministering through his love of gospel music, and that he relies on the Lord to give him the message in his songs. Williams was born in Florida but has lived most of his life in Fort Worth. He confessed his life to Christ at the age of 10 and began his music career in choir, orchestra, jazz and concert band. He studied music theory and composition at U. of Texas at Arlington and works full-time as a healthcare director for a local hospital. He is the head and founder of the SOS Productions music records label. He has performed with such popular artists as Tony Terry, Roger, and ZAPP. “Throw it Up!” by Andre' Williams is available online worldwide beginning March 15, 2014.